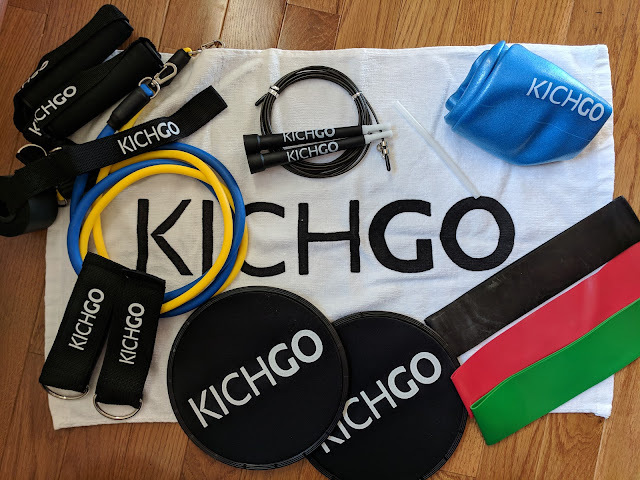 Thank you to KICHGO for the products. All thoughts and opinions are my own. I know I've said it before, but I'll say it again. I'm always looking for unique Christmas presents. They could be more practical or something unlike anything I've ever seen in the regular stores. Do you or someone you know travel frequently, but like to maintain their fitness routine? This KICHGO set is amazingly compact, easy to take anywhere, and their website with workouts is very convenient. Kit Rich, celebrity trainer, knows what it's like to try to stay healthy on the go as well as keeping her clients active while traveling. The KICHGO bag is perfect because it incorporates equipment that can be used in a variety of ways, staying true to Kit Rich's multidisciplinary approach. The call for her clients wanting to "take Kit with me" spurred Kit to create a small, practical bag that others could take anywhere. Weighing under 2 pounds, the kit is easy to travel with while providing a variety of routines. The KICHGO website has numerous workout videos from which to choose if you're a member. The videos are just like the KICHGO bag, easily accessible from anywhere and convenient on the go. Now there is no excuse to not maintain your health. I have been stuck in a rut with exercising lately. KICHGO has been motivational. The exercise routines are very doable as far as time goes with my two littles and are very well rounded. I feel so good after exercising. I'm still amazed that everything one needs for a solid workout can fit in this bag. The KICHGO bag with 20 videos is only $65.00! It is an affordable and practical gift for any busy person in your life. Give gifts that keep on giving throughout the year.